When you eat out as much as I do, and eat as much unhealthy stuff as I do, a dinner filled with salads and healthy options is a welcomed change. 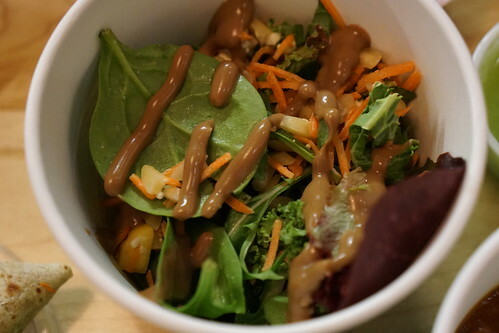 A couple weeks ago that change came in the form of a blogger dinner at Freshii in Back Bay. 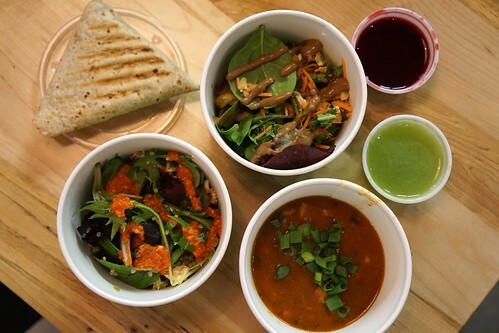 Freshii is a fast food franchise out of Canada that focuses on fresh, healthy items like salads, wraps, juices and such. They have multiple locations in Boston including one on Dartmouth St in Back Bay. 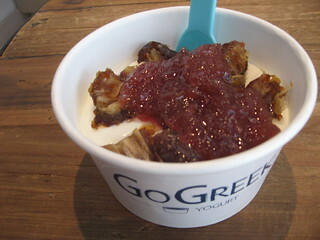 Combining the popularity of Greek yogurt and Pinkberry, Go Greek Yogurt provides a place in Beverly Hills to get authentic, imported Greek yogurt with various toppings. The yogurt is flown in directly from Greece. 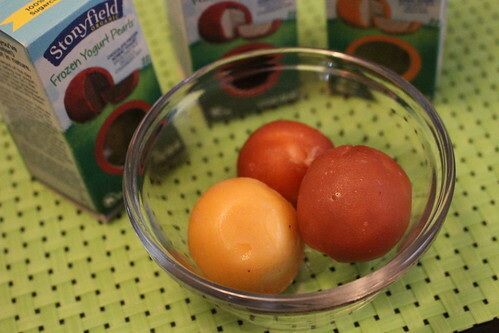 There are three options for the Greek yogurt, based on the fat content. The most authentic one is 10% fat but you can also get a 2% or a nonfat Greek yogurt. The 10% obviously tastes the best, but the 2% is still smooth and creamy. I can't eat the Greek yogurts they sell at the grocery stores without adding something to it, but this one I can eat by itself. 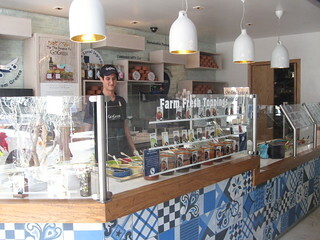 The yogurt is stored in terracotta bowls, and when you order some to go they will also pack it up in terracotta pots. I want to get one just as a souvenir! Before moving on to the toppings, don't miss the two most important sections: the preserves and honey. 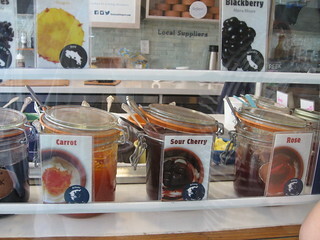 They have authentic preserves that the Greeks eat with their yogurt, including carrot, sour cherry, and rose preserves. After Pinkberry, there was Yogurtland, Red Mango, all the way to Fro Play (no I'm totally serious). 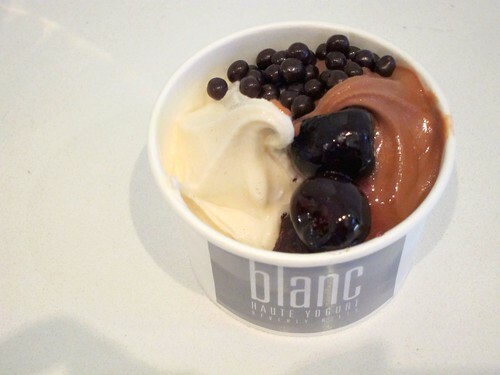 Thinking that frozen yogurt had pretty much jumped the shark, when I heard about Blanc back in 2009 I didn't pay much attention even though it touted being a "premium" yogurt, organic, etc with "premium toppings". 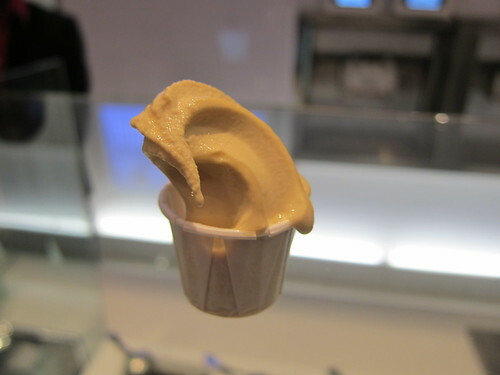 It wasn't until I finally went to their summer launch party did I find out - it really is an upgraded, sophisticated version of froyo. Appropriately located in Beverly Hills, the modern decor is stark white and minimalist - my kind of place. 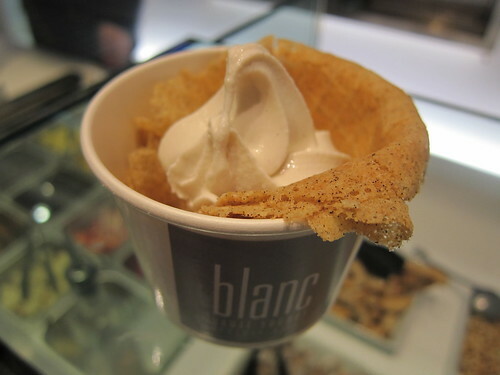 Blanc offers four flavors everyday, at least half of which would be 100% organic, and none of which uses high fructose corn syrup. The owner and founder, Leo Leonard, personally works on the recipes with the dairy factory who makes them in small batches. 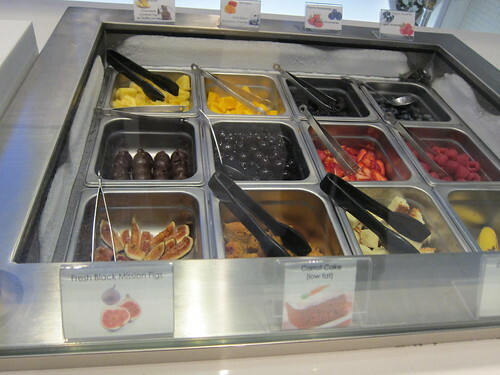 You can find the usual fruit topping suspects (strawberries, blueberries, raspberries, mangoes) except that everything is organic and looks fresher and plumper than anything I've seen at Pinkberry or Yogurtland recently. They don't even peel and cut the bananas until you order them here. On the not-so-expected side: black mission figs! And juicy amarena cherries (these are amazing with the vanilla) along with chocolate-dipped truffle-stuffed figs, Rabitos. Not into fruits? Top your creme brulee yogurt with Valrhona chocolate pearls, truffles imported from Spain, or organic carrot cake made by a local baker. Some of the rotating flavors you can find here include creme brulee, chai tea latte, organic peach passionfruit, and of course organic vanilla and some sort of chocolate. There's no tart flavor in their vanilla, unlike Pinkberry's plain, because apparently that tartness comes from the addition of citric acid. 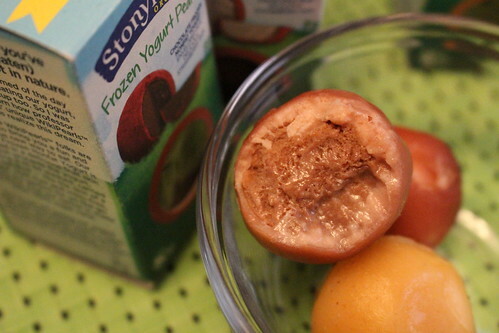 If you want tart, get the peach passionfruit. In about a month or so they will be rolling out the "crepe flute". Forget waffle cones, this crepe flute is crisp and more delicately crumbly than thick waffle cones. 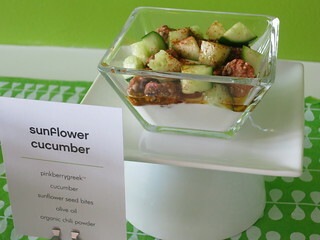 It complements the vanilla yogurt very very well. 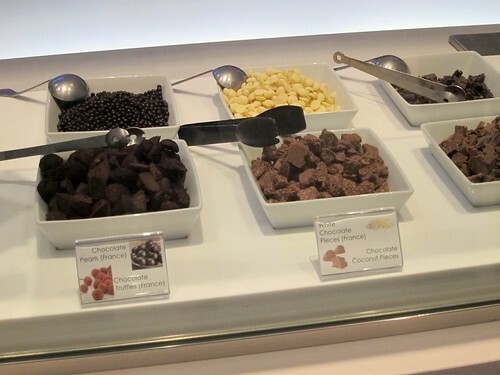 The prices here are a little more expensive than, say, Yogurtland, where the small yogurt is $4 and each topping is $0.40 but the higher quality of the yogurt and especially the toppings shows, and is worth it. 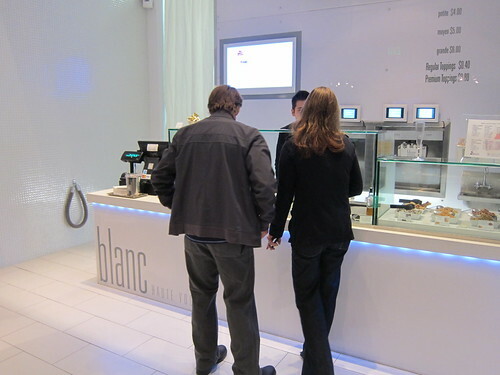 Disclosure: This was a free tasting hosted by Blanc.